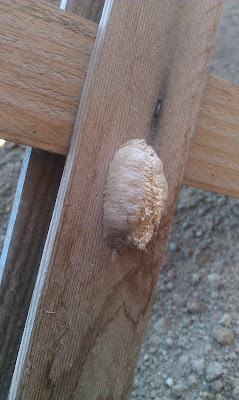 The only reason I know this is a preying mantis egg case is that we once ordered one. I followed direction precisely but still found a web near the orifice after it opened and assumed few made it out alive. We love preying mantises. They are such a fun, interesting bug. When I grew up (in the Sacramento Valley) we saw them constantly. I hardly remember a time when my dad didn’t come in from the yard without one hitching a ride on his back. My husband wasn’t as familiar and he thought they were the coolest bug in the world. So, when we found our first one several years ago–I brought it inside. We looked at it and held it for hours. I once had a friend who said she allowed one to live in her house, on the window sill, because it ate flies . We considered that but with great deliberation decided that it needed to live outside…run free…be who he was meant to be. I think one of the kids in particular was crying that it would die inside. So we carefully walked it outside and set it free. Before it hit the ground our dog ate it.